Online ordering menu for Vincenzo's Pizza (Granada Hills). 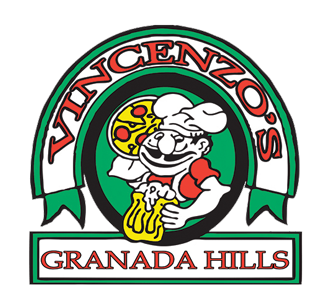 Vincenzo's Pizza Granada Hills has been serving the best pizza in the San Fernando Valley since 1990. We serve pizza, calzones, pastas, subs, and more! Finish with one of our deserts such as the Root Beer Float or the Apple Blossom. Find us south of Ronald Reagan Fwy at the corner of San Fernando Mission Blvd and Balboa Blvd. We're near the North Hills Shopping Center and Regency Theatres. Order online for carryout or delivery!